Update Rollup 5 for System Center 2012 R2 was recently released, and after installing the update in some of my environments, I’d like to draw attention to a few observations. I won’t go into too much detail about a step-by-step installation strategy because the good Kevin Holman has that covered. A fix was made to prevent Monitoringhost.exe from crashing when it cannot connect to Active Directory Domain Services (AD DS). The stack trace from the crash displays a “System.DirectoryServices.ActiveDirectory.ActiveDirectoryServerDownException” error. RunAs accounts can be distributed only to a selected computer through the distribution tab of Run As Account properties. When a computer that is in the distribution list is decommissioned from Operations Manager and the Run As account is opened, you receive the following exception, and no computers are shown on the list:System.InvalidCastException: Specified cast is not valid. at Microsoft.EnterpriseManagement.Monitoring.Internal.MonitoringObjectGenerated.get_Id()This issue is fixed and the exception no longer occurs. A fix was made to make sure that the console does not crash when a search is finished without filter criteria on Distributed application designer. Changes to entities are tracked by using the EntityChangeLogId in the EntityChangelog table and the EntityChangeLogId is mastered in the table as an Int64 value. ManagedType tables that begin with a MT_* refer to the EntityChangeLogID. The code that was used to insert into the ManagedType table had an Int32 data type instead of an Int64 data type. When the EntityChangeLogID reached greater than the Int32 limit, the exception crashed the MonitoringHost. This is fixed and the MonitoringHost no longer crashes. When traces are collected to troubleshoot PowerShell scripts, the logs do not display the parameters that are passed to PowerShell scripts. A code change was made to log this information to make troubleshooting easy. System Center Advisor is improved with many exciting features and is rebranded as “Operational Insights.” Learn more about the new Operational Insights feature. The product name is updated in the Operations Manager plug-in for System Center Advisor. A subscription is created by using the “created by specific rules or monitors” criterion. When such a subscription is edited and the monitors or rules associated with them are deleted, you receive the following exception:System.NullReferenceException: Object reference not set to an instance of an object. at Microsoft.EnterpriseManagement.Mom.Internal.UI.Controls.SourceChooserCriteriaItem.Search(CancelFlagWrapper cancelFlag)This is fixed not to throw an exception and display the other valid rules or monitors. When an explicit column width is set for a widget, the width is not honored in the grid that is displayed. This was caused because of an incorrect Regex validation expression. This has now been fixed and the explicit column width should start reflecting in the UI. Operations Manager datawarehouse throws events such as 31551, 31552, 31553 when there are problems inserting data to the datawarehouse. One reason these events can occur are because of SQL time-out exceptions. When such events related to SQL time-out exceptions are logged, the logs now also contain information about how to extend these timeouts. You can read more about these exceptions here. When a component such as Orchestrator tries to call the Operations Manager database function fn_AlertViewChanges, it could throw the “Could not continue scan with NOLOCK because of data movement” exception. This is triggered by a redundant NOLOCK statement in the SQL SP. This is fixed, as are any failures that are caused by this exception. PowerShell widgets that use $ScriptContext.Context display a blank. With this fix, the context now persists. Operations Manager previously displayed a Warning 60 days, 30 days, 1 day, and last-day hourly before the expiration of the evaluation period. This has been changed to an error so that you know Operations Manager will stop working as soon as the evaluation period is over. It also contains a link to a KB article that helps you convert the evaluation version to a registered version. Updating the UNIX/Linux agent for Operations Manager resets deep monitoring status for JEE application servers. This issue applies to Java Application Server instances that have “Deep Monitoring” enabled. When you upgrade the UNIX/Linux agent for Operations Manager, the instances are no longer “Deep Monitored,” and they require another execution of the Enable Deep Monitoring management pack task. By default, the rpcimap monitor for Red Hat Enterprise Linux 5 is now disabled. Red Hat Enterprise Linux 5.10 and later versions removes the default rpcimap daemon that’s present in earlier Red Hat Enterprise Linux 5 releases. Critical alerts are generated for the rpcimap service that’s not running on Red Hat Enterprise Linux 5.10. By default, the rpcimap monitor for Red Hat Enterprise Linux 5 is now disabled. However, it can be re-enabled by an override in the management pack. Monitoring in time zone UTC +13 (for example, Auckland, New Zealand with daylight saving time) causes the “Unix Process Monitoring template” to fail. When you use the “scxadmin -log-rotate” utility, this stops logging to the agent’s log (/var/opt/microsoft/scx/log/scx.log) after log rotation is completed. When you use the scxadmin program together with the -log-rotate option, logging in /var/opt/microsoft/scx/log/scx.log may not resume unless a restart is issued (scxadmin -restart). As mentioned above, Kevin’s article is very detailed, and an excellent reference, so I won’t reinvent the wheel. 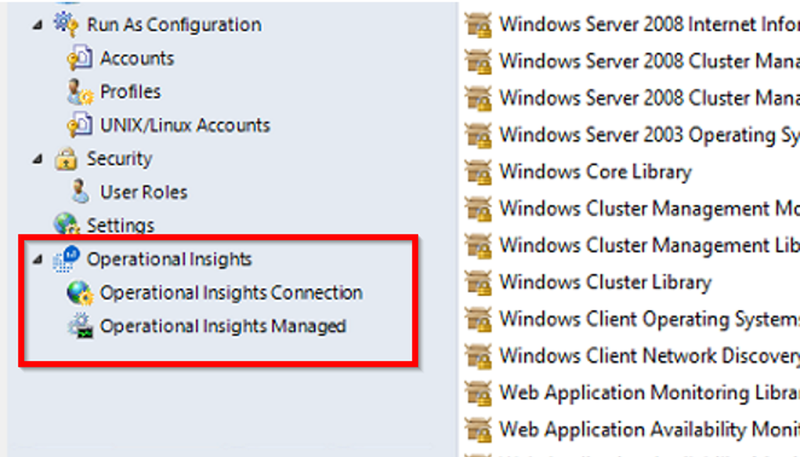 If however, you make use of Azure Operational Insights (OpInsights), and grabbed the update rollup Advisor management pack bundles, then you might have noticed the long overdue updates to the SCOM plug-in for Azure Operational Insights, in the form of a rebranding of the plug-in name from the old System Center Advisor name to the new Operational Insights name. 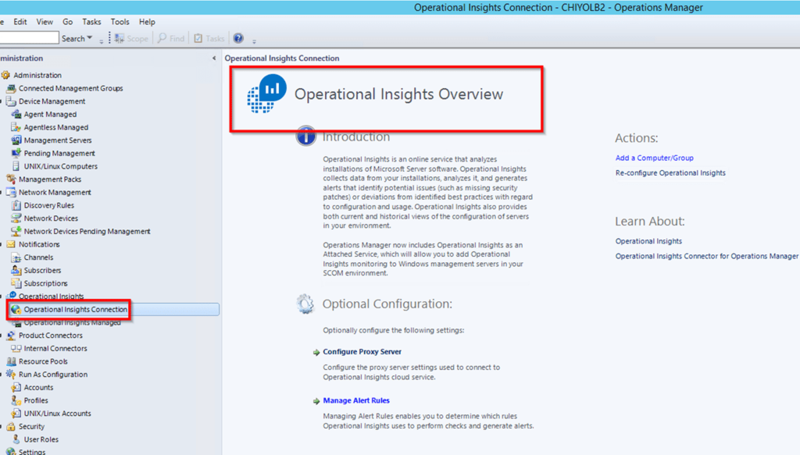 And the Azure Operational Insights page has received a face lift. I look forward to more exciting news from the AOI team, especially around new monitoring scenarios with IPs, and search data/ syntax improvements. Cheers! Author, consultant, strategist and thought leader who is passionate about data-driven management and architecture. Chiyo excels at helping clients think strategically about how to use technology to optimize the service delivery to the business, and to create fundamental business change and value.